CHESTNUT RIDGE, N.Y., Nov. 13, 2018 /PRNewswire/ -- Teledyne LeCroy today announced availability of the world's first High Definition arbitrary waveform generators (AWGs). The dual-channel AWGs are branded T3AWG3252 (250 MHz) and T3AWG3352 (350 MHz) and offer 16 bits of vertical voltage resolution, an output voltage window of up to ±24 V, and waveform memory of up to 1 GS/channel. 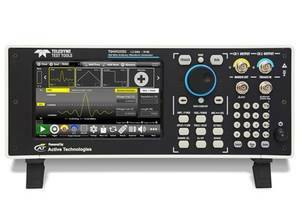 In addition to being AWGs, these highly versatile Teledyne Test Tools (T3) are able to function as arbitrary function generators or digital pattern generators. These instruments complement Teledyne LeCroy's High Definition 12-bit oscilloscopes for stimulus-response test applications in automotive; component/semiconductor test; aerospace/defense; and physics, research, and university lab settings. Waveform generators with high signal accuracy and precise waveform details are key elements in designing quality end products with shorter design cycles. By virtue of their High Definition 16-bit vertical voltage resolution, the new T3 AWGs produce the industry's highest accuracy waveforms with clean, crisp details. As a result, users gain test efficiency and increased confidence in the reliability of the results. Clean signals: The AWG delivers a pristine stimulus so that the DUT's response behavior is unaffected by distortion. Real-world signals: The AWG output comprises playback of previously acquired real-world signals from its waveform memory. Stress-test signals: The AWG emulates problematic or corner-case inputs to the DUT. Noise/interference immunity: The AWG emulates expected interference signals to its output to test the DUT's response behavior. The new AWGs offer an output voltage range of ±12 Vpk-pk (50Ω output into 50Ω input) that is further enhanced by the ability to shift the offset to ±6 V. Additionally, when driving waveforms from a 50Ω output into high impedance, the voltage output window widens to ±24 V, or 48 V. This represents a significant advantage in generating MOSFET gate-drive pulses in automotive and power-semiconductor test applications. Three functional modes are available in the T3AWG3252/3352 AWGs. They can operate as arbitrary function generators with a large variety of waveform options, providing versatile modulation capabilities. As an AWG, the instruments deliver complex and completely arbitrary waveforms with the ability to sequence analog/digital patterns using an intuitive user interface. In digital pattern generator (DPG) mode, users may create completely arbitrary differential or single-ended digital patterns at up to eight parallel bits. The instruments' eight digital outputs can be combined and synchronized with their two analog output signals, providing an ideal tool for debugging and validating digital designs. Pricing starts at $13,080 for the 250-MHz T3AWG3252 and $16,680for the 350-MHz T3AWG3352 High Definition dual-channel signal generators. Both are available now. For further information, contact Teledyne LeCroy at 1-800-553-2769 or visit teledynelecroy.com. Teledyne LeCroy, Inc. is a leading manufacturer of advanced oscilloscopes, protocol analyzers, and other test instruments that verify performance, validate compliance, and debug complex electronic systems quickly and thoroughly. Since its founding in 1964, the Company has focused on incorporating powerful tools into innovative products that enhance "Time-to-Insight". Faster time to insight enables users to rapidly find and fix defects in complex electronic systems, dramatically improving time-to-market for a wide variety of applications and end markets. Teledyne LeCroy is based in Chestnut Ridge, N.Y. For more information, visit Teledyne LeCroy's website at teledynelecroy.com.